This post is sponsored by Marina del Rey Foods but all opinions are my own. Thanks for supporting the brands that keep SRFD in the kitchen! I’m thrilled to be part of the Marina del Rey Foods Team, and will be sharing other fabulous recipes featuring their products on my social media channels — so stay tuned for more delicious inspiration! 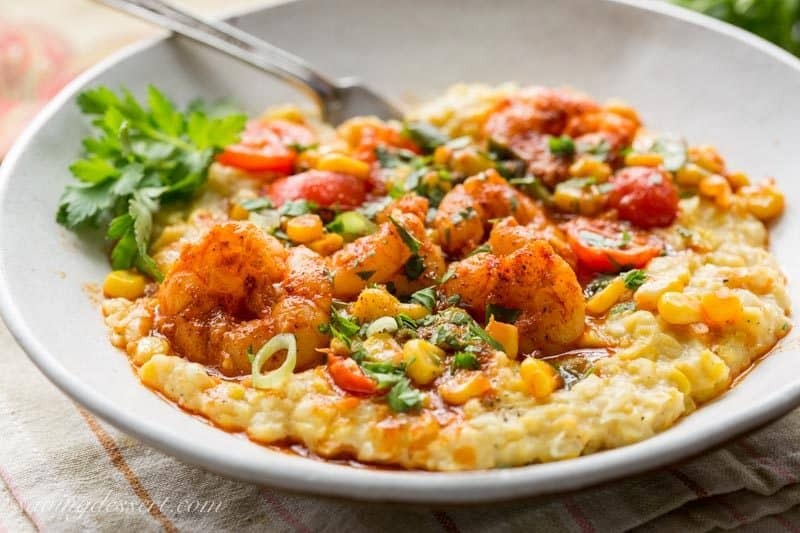 Spicy Shrimp & Fried Corn ~ A fresh and tasty twist on classic shrimp and grits! Creamy, sweet fried corn is topped with spicy shrimp, garden fresh tomatoes and green onions for a delicious bowl of healthy comfort food! 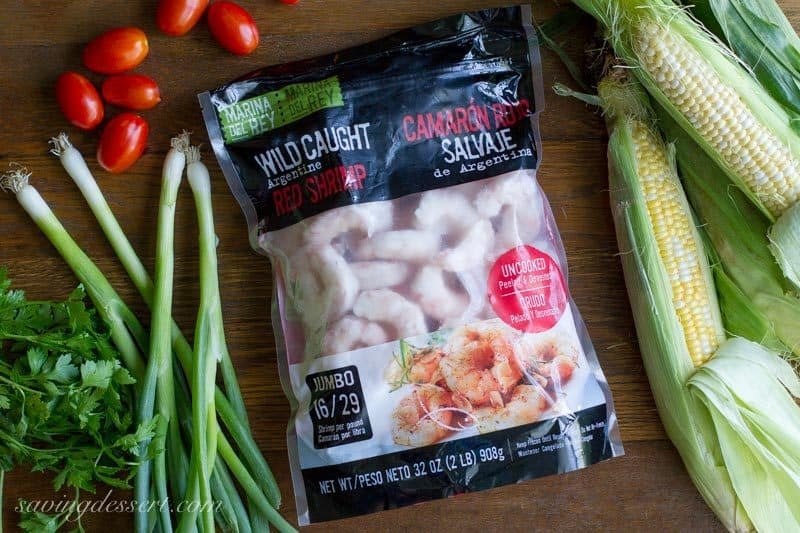 We couldn’t be more excited to share this recipe with you today featuring delicious Wild Argentine Red Shrimp from Marina del Rey Foods. Marina de Rey Foods is dedicated to bringing us high quality, environmentally responsible wild caught frozen seafood. These wild Argentinian shrimp are pure with no added water or chemicals. And, as you may know, wild caught seafood is a quick and healthy meal option. High in protein, low in calories and rich in Omega-3s, wild caught seafood can help promote a healthy cardiovascular system. In addition to exceptional flavor, wild caught seafood if free from antibiotics, hormones, color, and chemicals found in farmed seafood. Red Argentine shrimp have great texture and an amazing sweet flavor, closer to lobster than any other shrimp we’ve tried. I’m hooked, smitten, and inspired! I never knew shrimp could taste this good and I’m willing to bet you’ll see more recipes featuring Marina de Rey Food’s Wild Caught Red Argentine Shrimp coming soon! You don’t have to go to a fancy restaurant to enjoy amazing seafood recipes. I got so excited telling you about our favorite shrimp that I almost forgot about our delicious recipe! I used my Mom’s recipe for Fried Corn (creamed fresh corn) as the base and topped it with a super simple, spicy pan sautéed shrimp, tomato and green onion mixture. You know how summer corn is so sweet it tastes like it has sugar sprinkled on top? Well, it’s perfect combined with these buttery, spicy shrimp! 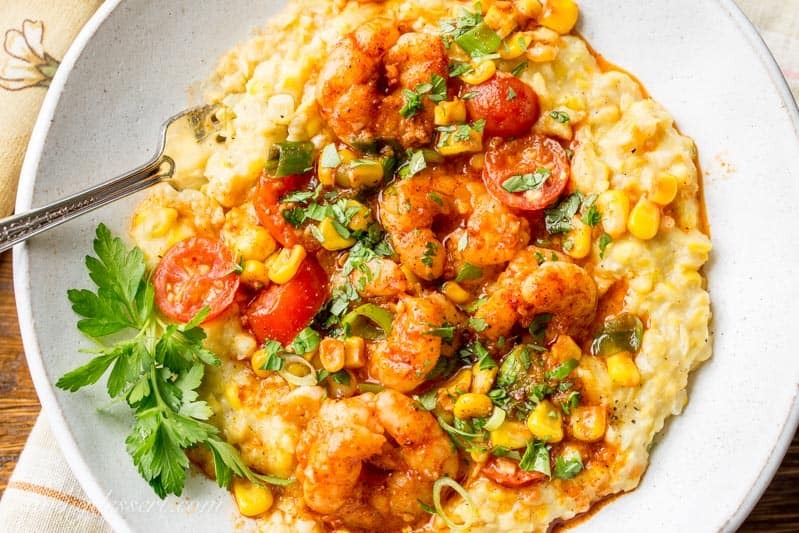 Our Spicy Shrimp & Fried Corn is a nod to traditional shrimp and grits, but so much better. The shrimp can be seasoned with your favorite spicy blend, like Old Bay, or Tony Chachere’s, but personally we’re addicted to dry Sriracha Seasoning so that’s what we’ve used here. If you haven’t picked up a jar yet, please do and try this super easy, spicy and flavorful dish. Spicy and sweet, fresh and healthy – what more could we want from an super easy recipe?! Check out our quick video and watch how you can make this easy, quick and delicious recipe at home too! 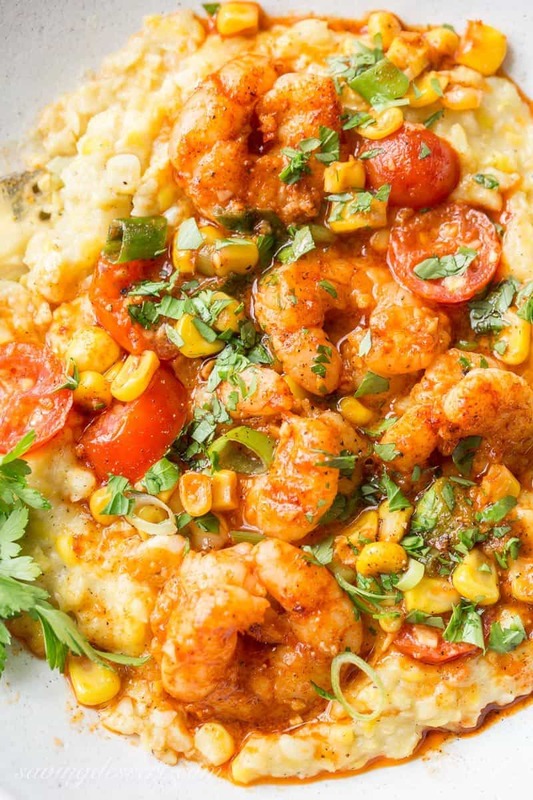 A fresh and tasty twist on classic shrimp and grits! Creamy, sweet fried corn is topped with spicy shrimp, garden fresh tomatoes and green onions for a delicious bowl of healthy comfort food! 2 teaspoons dry Sriracha seasoning or your favorite spicy blend such as Old Bay, Tony Chachere’s, etc. Cut the corn kernels from the cobs. Reserve the corn cobs. Measure out 1/2 cup corn kernels and set aside. Add the remaining kernels to a food processor and pulse 6-7 times or until creamy. Using a dull knife, scrape the pulp and milk from the reserved corn cobs and add to the creamed kernels. Melt butter over medium heat in large skillet. Add corn, corn pulp, salt, pepper and sugar. Sauté for 2-3 minutes then add the milk and cornstarch. Bring the mixture to a boil, then reduce the heat to low and simmer until the corn is thick and creamy. Add more milk or cornstarch if needed for desired consistency. Remove the skillet from the heat and cover to keep warm. In a small bowl, combine the Sriracha seasoning, paprika and black pepper. Place the shrimp in a medium mixing bowl and toss with the spice mixture to coat. Heat a large stainless steel skillet over medium-high heat. Add 2 tablespoons olive oil and 1 tablespoon butter to the skillet. Once the butter is melted, add the garlic and sauté for 1 minute or until fragrant. Add the shrimp in a single layer and cook for 1-2 minutes, then turn. Immediately add the tomatoes and reserved corn kernels. Cook, stirring occasionally until shrimp are done and the tomatoes begin to soften, about 2 minutes. Remove from the heat and stir in the sliced green onions. Serve immediately spooned over bowls of fried corn. Garnish with chopped parsley if desired. 6 cups of frozen corn may be substituted for fresh, but the texture may not be as creamy. Thaw and drain the frozen corn before adding to the food processor. I would love to connect with you on social media! If you try our recipe, please use the hashtag #savingroomfordessert on INSTAGRAM for a chance to be featured! FOLLOW Saving Room for Dessert on FACEBOOK | INSTAGRAM| PINTEREST | TWITTER for all the latest recipes and updates. 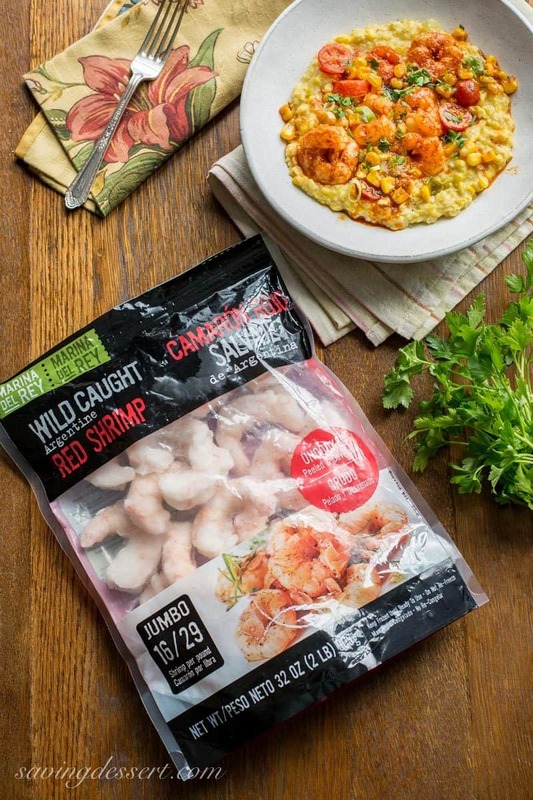 This Marina de Rey Foods Wild Caught Argentine Red Shrimp is great in just about any kind of recipe from soups to salads, casseroles and sandwiches. We’re very fond of our Chicken, Sausage & Shrimp Gumbo, and this delicious Chili Garlic Shrimp too. We also love our easy and delicious adaptations on classic recipes for Shrimp Scampi with Asparagus and Tomatoes and Shrimp Piccata over Zoodles. Do you think I could prep the corn a day ahead of cooking? Yes I think you could easily do that Susan. I think that will be fine. Enjoy – we love this dish! Tried this recipe……love corn, love shrimp and love good quality cherry or grape tomatoes. The next time, I would make the corn “risotto style” a la Donna Nordin of Cafe Terra Cotta fame. She made this corn as an appetizer. There is no rice in it but fresh corn, 2 different kinds of cheese, cream and chicken stock, reduced down until the consistency is correct. The crispness of the corn and the texture of the shrimp and tomatoes are heavenly together. Love the blog and looking forward to trying many more recipes. That sounds like a great summer meal! I’m always a fan of grits! This looks like on gigantic bowl of comfort food! YUM! Yes indeed Jane! It’s a super special dish worth of company or a weeknight dinner. My kids love shrimp…can’t wait to try this recipe. So glad you’re going to try it Sandi – it is a keeper! That is a seriously delicious and hearty bowl of comfort. Thanks Sara! We absolutely love it! You knocked it out of the ballpark with this, Tricia. It looks so incredibly mouthwatering! We just got back from eating some amazing food in Charleston and I thought this was shrimp & grits at first. : ) It really looks better than a restaurant dish! Thank you Monica! I can’t wait to read all about your vacation. Charleston is an amazing place to visit. Thanks Laura! It is a favorite dish for sure. I just love that you used fresh corn in this recipe. It looks amazing and the video is great too. Thank you Dahn – the fresh corn is so sweet and terrific combined with spicy shrimp. Thanks for stopping by! I love it!!! I love shrimp and this looks FAB! Thanks Deanna! It is a favorite for sure! This dish sounds absolutely divine. I don’t usually buy frozen shrimp, but it sounds like this is a brand/varietal I should try just based on the flavors you described. Thanks Rae – sometimes the shrimp that’s available in the seafood case has been previously frozen, then thawed. This way you can thaw what you want, when you want it and avoid shrimp that has been laying around in the case for a day or two 🙂 This is a delicious shrimp and terrific tested recipe. Hope you enjoy! I’ve only purchased wild caught shrimp for several years now. I haven’t seen this brand available here but I’ll have to look! What a delicious and beautiful dish, Tricia! You can find this shrimp at Sam’s Club. It’s fairly new to the US so I hope it will be more wildly available soon. Thanks so much for stopping by Susan! Yeah! Hope you love it too Jessie 🙂 Such an easy and delicious combination. Thanks! This is seriously gorgeous. I am just in awe. Your photos make me feel like it’s right there in front of me. Aww Kim – that is the sweetest comment ever! Thank you very much – hope you’ll give this recipe a try. Thank you Gina! It is a favorite flavor combination for sure. Thanks Larry! You can find this shrimp at Sam’s Club now in the US. Very tasty! Love how creamy and flavorful this looks! Thanks Matt – homemade creamed corn is a world apart from the canned version. Hope you’ll give it a try! Thanks Regina – my mom used to make it all the time. I love the spicy shrimp and creamy corn combination . It’s perfect with all the fresh corn available. Pinned! Thank you Gerlinde – I know you won’t be disappointed! That spicy rub! That looks exactly how I like to cook my shrimp. I have never had a homemade creamed corn– I am sure this recipe will turn me into a believer! Looks amazing, as always Tricia! Lucky you for getting such great shrimp. Lucky me for getting such a great recipe. Shrimp and corn are two of my faves. I feel lucky you stopped by Abbe! Thanks – I bet you’ll like this recipe! This shrimp recipe looks terrific. I wish I could have this for dinner tonight! Me too Miryam! Love fresh summer corn and this delightful shrimp. So tasty 🙂 Thanks! This looks delicious. So great for summer. Oh my this looks fantastic!! I am always on the hunt for new ways to eat shrimp and I KNOW I would LOVE this! Yeah – thanks so much Jessica – I bet you will love it, we do! I love spicy shrimp and grits so this must be soo good! Yes it is Monique – sweet corn and spicy shrimp – a perfect match 🙂 Thanks for stopping by! Oh my this looks like tasty goodness! You will be dreaming about this shrimp Carolyn! So tasty – thanks for stopping by! I’m absolutely in love with this recipe! And those shrimp … they’re amazing. So great to find shrimp that I can feel good about eating. Thank you Mahy 🙂 It’s easy to make too – bonus! Tricia this looks absolutely amazing!!! Can you come over? I have wine!!! This dish is just gorgeous Tricia! 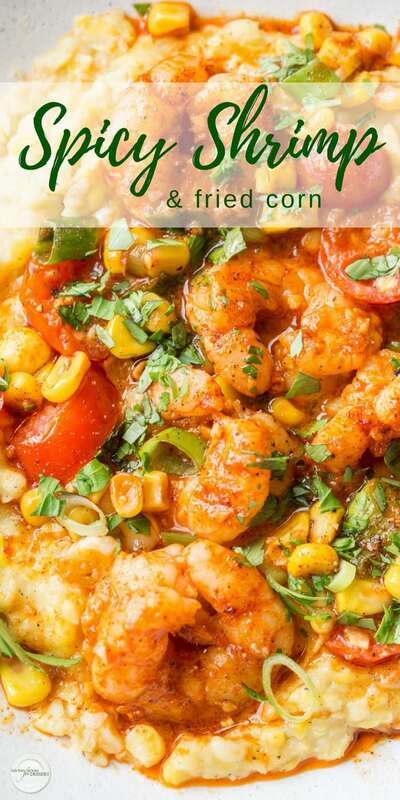 The spices on the shrimp and all that delicious corn…this is a dish I can’t wait to try! I’ve got to have shrimp for lunch now. Thank goodness I have a big supply of Marina del Rey in my freezer, lol. This shrimp just makes me so darn happy! Simply a gorgeous, delicious recipe, Tricia. You outdid yourself and that’s not an easy thing to do! Awww thanks Robyn – wish I had some more of this dish for lunch! Can’t wait to make it again before the corn is gone. Loving this super scrumptious twist on shrimp and grits! I can’t wait to try this shrimp! You are going to love it Jenn – so delicious 🙂 Thanks! Such absolutely gorgeous photos! I love this twist on shrimp and grits. The color on the shrimp is so striking. Thanks Tara – we LOVE this wonderful shrimp – hope you’ll give it a try! This meal manages to look comforting and fresh. The addition of corn and tomatoes and a little spice really lifts this entire dish. It’s gorgeous. Thank you Jane 🙂 The corn is naturally sweet and combined with the well-spiced shrimp, it’s the perfect combo. This looks like everything I want in an autumn meal, I adore seafood and this just looks so comforting! It really is perfect comfort Amy – thank you! Thank you so much Sue! LOVE this red Argentinian shrimp – buttery texture and great flavor. Spicy shrimp and fried corn? Sign me up! Such a great combo, can’t wait to try it at home. This sounds and looks like an amazing dinner – beautiful pictures! And I agree with you on the wonders of high-quality frozen shrimp. I have to go a pretty out of the way grocery store to buy good “fresh” (read: defrosted) shrimp where I live, so having a bag in my freezer is a terrific way to be sure I can produce a yummy dinner like this on short notice. 🙂 Pinned this one to try soon! Thanks Monica! I hope you’ll try this shrimp because it’s delicious and so easy too. Thanks for pinning! Thanks Jennifer – this shrimp is fantastic and the fried corn has been a favorite for years. Hope you’ll give it a try! This looks spectacular Tricia and your video is wonderful. What a simple but dinner party worthy recipe! Those shrimp sound amazing will be looking for them next time I shop! Thanks so much Chris – you’re going to love these buttery good shrimp! Usually I would go grab shrimp, but this fried creamed corn looks incredibly delicious and tempting that I wish I could dig in right away! A marvelous dish! Thank you Angie! My mom made fried / creamed corn often during the summer. Hope you get the chance to make it!